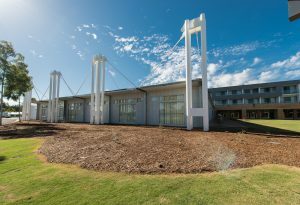 Stockholm – October 11, 2017 – The Crowne Plaza Hunter Valley, an award-winning luxury resort in Australia, has successfully implemented several of ASSA ABLOY Hospitality’s innovative security technologies, including ASSA ABLOY Hospitality Mobile Access, VingCard Signature RFID electronic locks and the Visionline online platform. The property, which is situated in the heart of the Hunter Valley wine region, is home to a variety of luxurious amenities, including a golf course, leisure activities and breathtaking views of local vineyards. Prior to the recent upgrade, Crowne Plaza Hunter Valley had a competitor’s door lock system installed. As part of an initiative designed to reposition the property as a technologically advanced resort, management sought out innovative technologies that utilize mobile solutions to allow for keyless entry. After conducting research on ASSA ABLOY Hospitality and several other lock providers, hotel leadership opted for ASSA ABLOY Hospitality’s innovative electronic locks and mobile solutions, based on its established success in the hospitality industry worldwide. Likewise, placing a priority on guest safety with the installation of ASSA ABLOY Hospitality’s Visionline online locking solution, resort staff also now has the capability to remotely monitor all entry activity from one central location. With this feature, management can control who has access to certain areas and when. If it is ever suspected that unauthorized entry has occurred, management can remotely deactivate or restrict access, further increasing property security.